Last year we were honoured to read The Silent Hours by Cesca Major - a touching and fitting memorial to events in 1940s France. 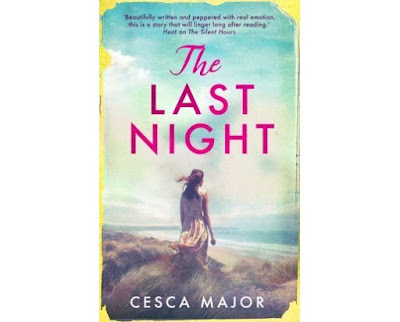 Today we review her latest novel - The Last Night. As with her previous book, this is based on a true story - this time, 1950s Cornwall. And, like her last book, this one tells the story across two different time points - the 1950s and modern day. In 1952, Abigail leaves Bristol whilst mourning her mother's passing. With nowhere to go but her sister's home, she goes to spend time with the only family she has left, but who she barely knows. In the weeks and months that follow we discover what the family home is like, we learn more about Abigail and her sister, and their interactions in the bustling coastal villages. In 2016, Irina starts to restore an old bureau for a client. As she finds hidden artefacts and clues about the history of the furniture and its previous owner, she becomes drawn in to the tale from 1952 as she tries to uncover what happened, to whom, and why. The two timepoints are linked by a supernatural event. I'm not usually a fan of supernatural happenings in novels, but this worked well as a device - not overly dramatic, but a key to pulling the two stories together. This is a beautifully written book. I won't give anything away here, but I urge you not to read the historical note at the end of the book until you have finished the novel. As with her previous work, Cesca thoughtfully gives details there that help bring the truth behind the tale to life. For me, this book is about relationships. Between Abigail and her sister, her brother-in-law and with Richard. And between Irina, her mother, and her one-time partner Andrew. Both of the leading ladies have secrets, past lives and hidden hurts. The stories develop and we learn more about their personal histories, and the welcome catharsis that ensues as they share their hurts. The leading men in the stories show incredible restraint and understanding, and the positive outcomes that take place or are hinted at offer hope of new beginnings and fresh starts. We know from the start that something bad has happened, and the two stories draw us ever closer to that tragic event. Yet despite that, this book is remarkably uplifting. I really enjoyed this book - the interleaving of two stories, the link across the decades, and the insight into the human condition. This is another brilliant book, and a beautiful and moving response to the events of 1952. Again, not giving anything away - the part that really struck me was the reaction of Abigail's sister towards the end of the book. She knew and understood. And despite the effect on her personally, she chose the most incredible and selfless reaction, one which would remain with her for the rest of her life. The Last Night is available from Atlantic Books, and I encourage you to go and find a copy for yourself. 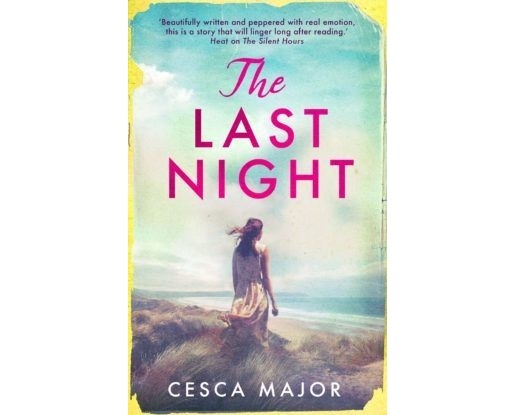 I'm looking forward to seeing what Cesca Major has up her sleeve for her next novel! Disclosure: Atlantic Books sent me this book to keep for the purposes of review. All opinions are our own. 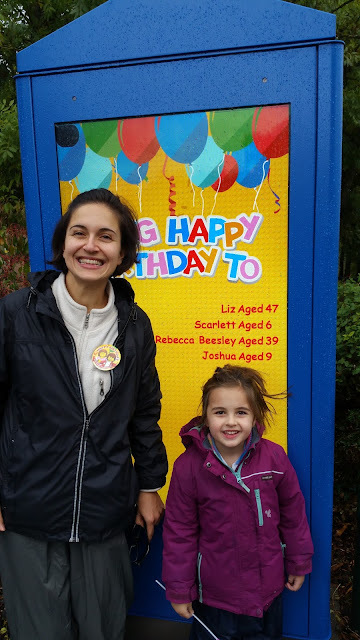 A few years ago I actually said that I'd love to spend my birthday at LEGOLAND - little did I know at the time that one day it would actually happen. We'd been invited to do a press review on our blog the previous week, but a last minute panic ensued when we realised that D's arm still in plaster would mean that there was little he could do. We delayed for a week until the plaster cast came off. So the new date happened to coincide with my birthday. We arrived well prepared kitted out in waterproofs during a monsoon style downpour. I was particularly proud of my genius idea of wearing nappy sack bags over my socks but inside my trainers to keep my feet totally dry in the rain and on the rides where you are likely to get wet. 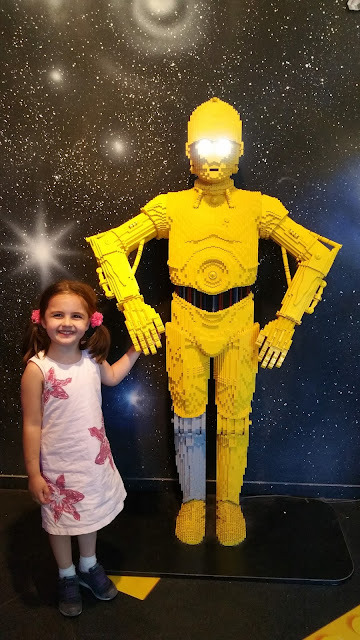 We'd been fortunate to visit LEGOLAND earlier this year during sunny August when we had an overnight stay in the LEGOLAND hotel (and yes it is fabulous - it would deserve another blogpost of it's own but it wasn't the focus of our trip this time). So the photos appearing in this post will be a bit of a mish mash of photos from our summer visit as well as our most recent rainy day visit. The weather did actually brighten up during the day and so we didn't get quite as soaked as we thought. Now let's get to the nitty gritty of the best rides at LEGOLAND. 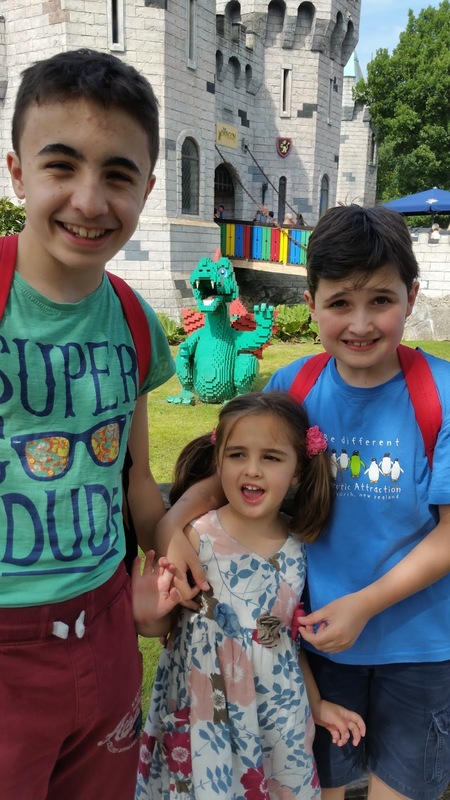 My kids are now aged 12, 10 and 4 and there was definitely something for everyone. Perhaps in a year or two the boys won't find it so exciting, but at the moment it is the perfect theme park for us all. 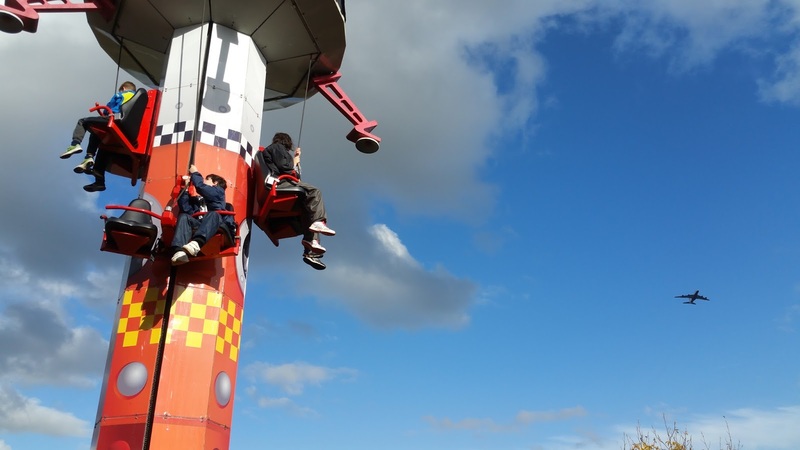 With it being October and the weather being rather rotten at the start of the day, it meant that queues were very short with many of the rides having no queues at all. A very different story from summertime. So we all got to go on our favourite rides. Viking river splash is great because we can all fit in a boat at the same time and enjoy the ride together. Be warned you will get wet on this one but it's all part of the fun. The Dragon roller coaster was the boys favourite. They loved the thrill of the speed and the twists and turns. Me and Miss T gave this a miss as we found the smaller Dragon's Apprentice a bit too fast for us too. Coastguard HQ in LEGOcity was enjoyed by all. Being able to drive the boat yourself seems to be the big attraction of this one. Boats featured heavily in our day as Miss T also enjoyed the mellow boat ride for Fairytale Brook and the boys got drenched on the Raft racers. 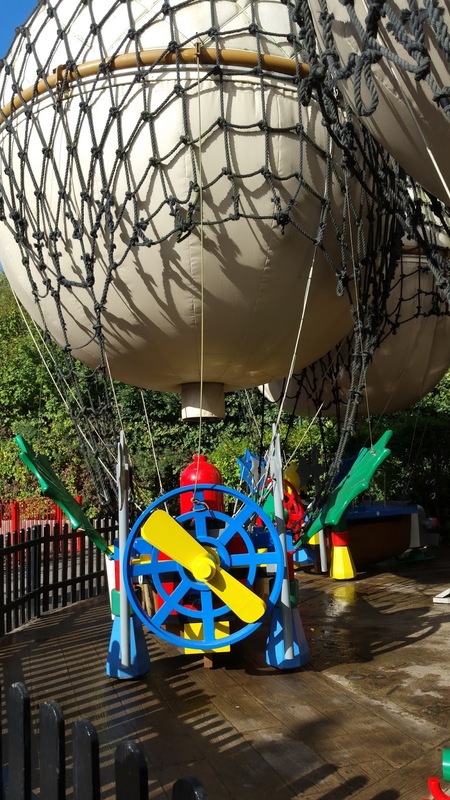 LEGOcity is also the location for Fire Academy, L drivers, and Balloon School. All things really enjoyed by Miss T. Turns out my competitive streak is stronger than I thought when I HAD to make sure our fire engine won the race in Fire academy. The rest of the family did me proud when they went on without me. 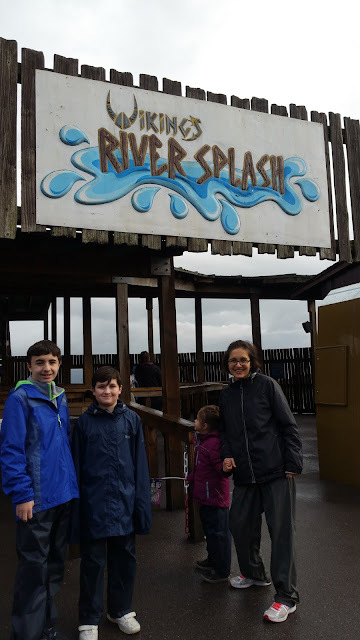 In the adventure land part of the park, Squid surfers are great fun - not too fast and furious and whilst you can get wet on it, it was variable wetness depending where you were on the ride it seemed. Atlantis submarine is a really popular attraction located at the far side of the park. We usually make a beeline for this to avoid the queues but this time there were no queues. 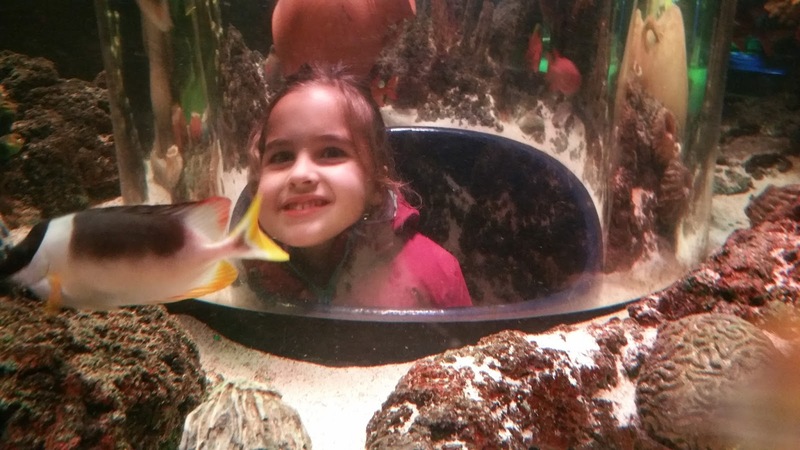 Miss T especially enjoyed heading into the submarine and seeing the fish. 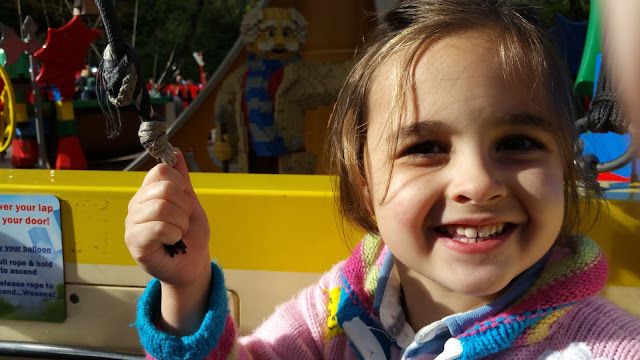 Heading over to the miniland part of the park, we've always enjoyed seeing famous landmarks including the London eye, Big Ben, and the Eiffel Tower. 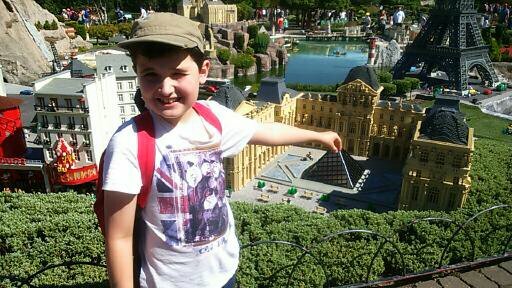 Here's D with a spot of deja vu recreating his Louvre moment from when we went to Paris last year. Located nearby in Imagination centre is one of my personal favourite rides...Space Tower. I love the simplicity of being able to pull yourself up and then enjoy the thrill of whooshing down the tower. The LEGO 4D movie theatre and Skyrider are also in this area. 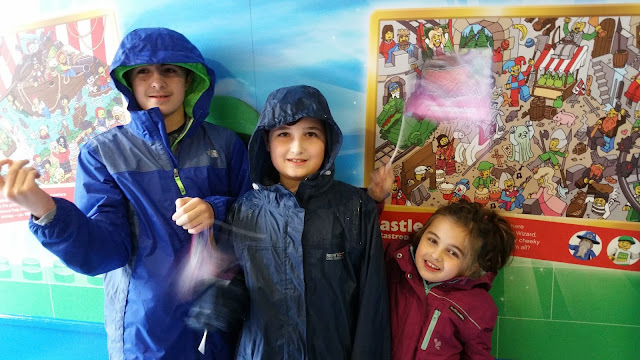 On this occasion Skyrider was closed because of weather and we gave the theatre a miss having enjoyed it on several previous visits. 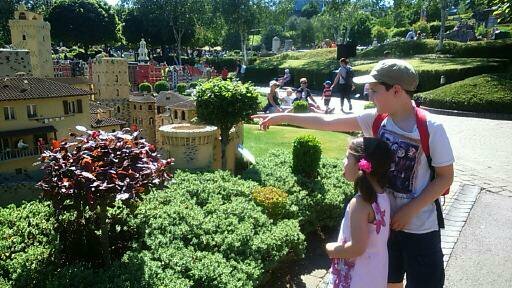 Turns out we have so many favourite parts of LEGOLAND... The classic log flume type ride, Pirate Falls was braved by everyone but me. However, I love Laser Raiders - another opportunity for my competitive streak to shine. For the first time ever we ring fenced some time in our day to watch the Pirates of Skeleton Bay show and I'm really glad we did. It kept the kids entertained and was really enjoyable seeing the pyrotechnics, water sprays and acrobatics. 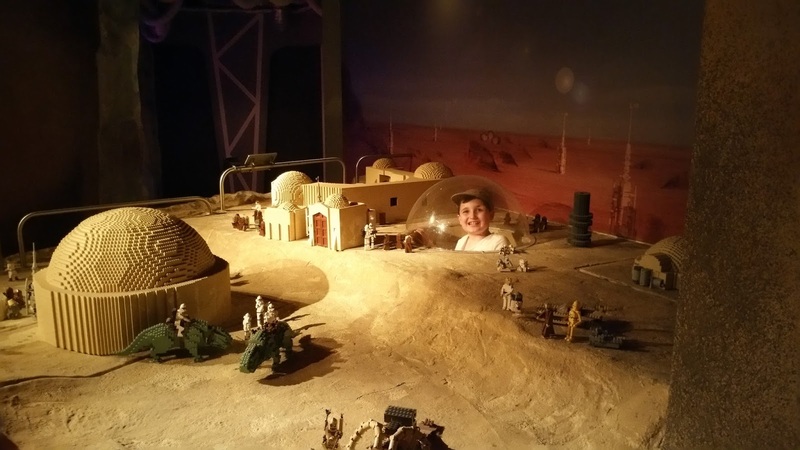 The Star Wars miniland exhibition was a must for our little Star Wars fan. 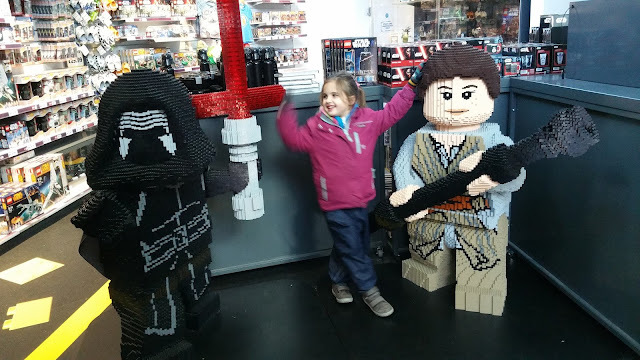 You may remember how star struck she was meeting the waxworks at Madame Tussaud's and here we experienced a similar excitement seeing all our favorite Star Wars characters in glorious LEGO. There were various Brick or Treat events going on for Halloween. For our family, we feel that Halloween is not an appropriate celebration for children, something echoed in the child development literature I studied for my childcare diploma, so apart from the Brick or Treat flags that the kids were given, we were pleased that the other activities were not 'in your face' and could easily be avoided. Something else that doesn't mix well with kids is smoking. We were pleased to see that LEGOLAND has designated smoking areas. We'd love to actually see these enforced as sadly there were lots of people smoking elsewhere too. 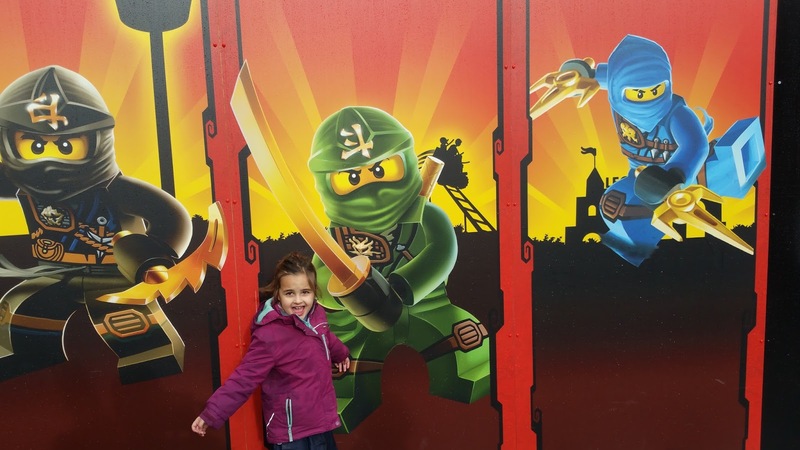 Better still, as a child-orientated attraction, we'd love to see the whole of LEGOLAND become totally smoke free. In terms of food, we've been pleasantly surprised with the actual restaurants both in the hotel (we felt the Bricks restaurant had plenty of healthy choices on our previous visit), and on site where we opted for the pizza and pasta buffet and were pleased to find the salad bar and drinks like water and fruit juice were included in the price. I just wish that there were healthier snacking options on site! We ended up having to take our own favourite vegetable crisps with us and then once they'd run out ended up with popcorn which seemed to be the best option we could find. 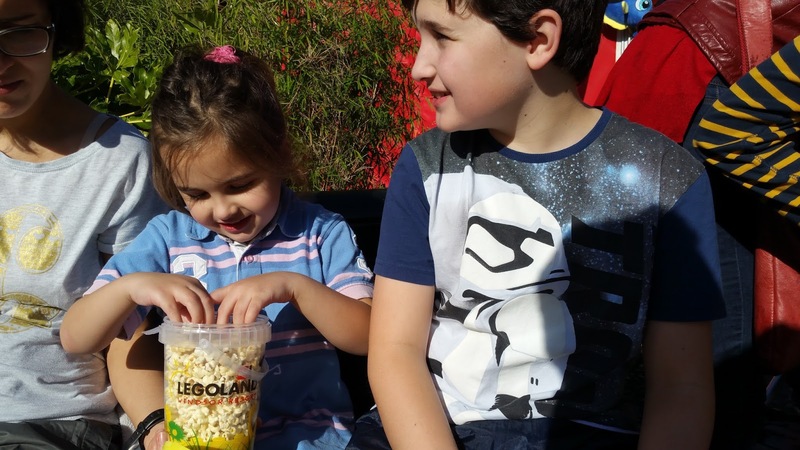 My feeling is that somewhere as wonderful and influential as LEGOLAND could do so much more in terms of leading the way with helping kid's (and their parents) eat more healthily. I would love to see them offering some really good truly healthy yet tasty snacking options in future. There's lots planned for next year and that is the great thing about LEGOLAND, there are things that are changed every so often to keep it fresh and interesting. 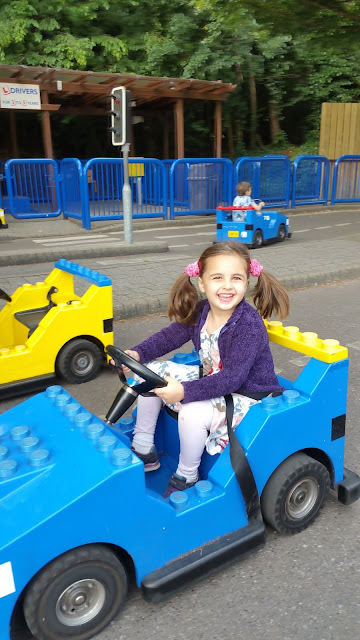 We'd like to say a massive thank you to LEGOLAND for our recent day visit - it was a brilliant place to spend my birthday! (We were given day tickets for entry for the purposes of review. All opinions are our own). We've had a bit of an Angry birds theme running through this year. Both the boys are crazy about playing Angry Birds on their iPads and earlier this year we got to see the Angry Birds exhibit at Madame Tussauds, followed by a preview screening of the Angry Birds movie the next day. 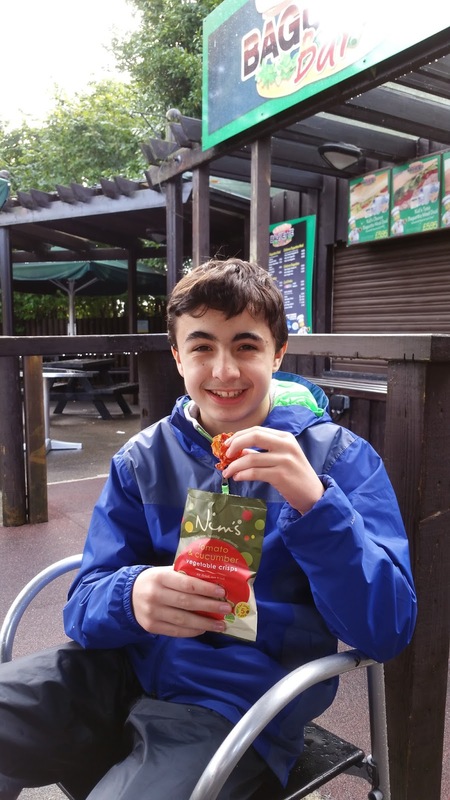 We regularly buy Frubes as they are a handy way of getting the kids to eat yogurt and get plenty of calcium and vitamin D. They're convenient for packed lunches too. Since we spotted the Angry Birds themed ones, the kids always like to choose which character to have each day and they like reading the jokes and quotes on each of the Frubes. We've been entering our codes from the packs online too for a chance to win a holiday to the Bahamas as well as merchandise prizes. The on pack promotion ends on 31st October 2016 so don't miss the chance to enter. On the Frubes website, there's also the chance to play a little Dance off game with the Angry Birds characters and the Pigs. I have to confess that I didn't have much luck with that as those piggies kept winning! But what I do know is that my own little dancers have got some great #FrubesMoves. So fuelled by their Frubes, here they are in this little video showing off their best dance moves. See if you can spot some Angry Birds inspired moves in there too with the eyebrows and catapult actions! They've all had great fun taking part. Hope you enjoyed seeing their #FrubesMoves. Thank you to Frubes for sending us some vouchers to buy packs of Frubes. 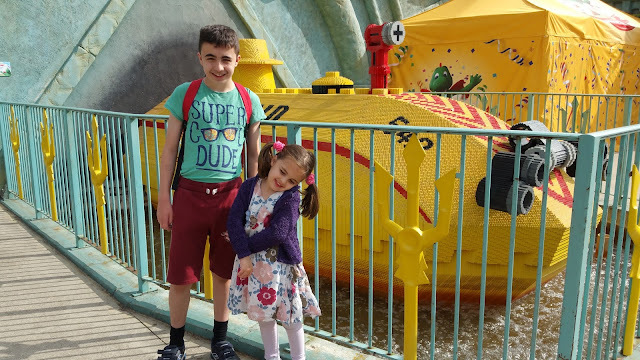 This post is an entry for BritMums’ #FrubesMoves Linky Challenge, sponsored by Frubes Find out more about the challenge here. Earlier this year we enjoyed our first taste of Paper Mario with Mario & Luigi Paper Jam Bros on the Nintendo 3DS. So we were delighted when Nintendo sent us a copy of Paper Mario: Colour Splash for Nintendo WiiU. The premise of this fun and engaging game is that someone has been stealing all the colours from the paper characters, and it is down to Paper Mario to save the day, accompanied as ever by Paper Peach and Paper Toad. The adventure sees Mario tracking down Prism Island's Big Paint Stars, which will eventually lead to him being able to restore both colour and peace to the land. There are loads of adventures, puzzles and other characters along the way, as Mario sets off with his trusty Paint Hammer. We loved this game - the 2D characters exploring a 3D world and the fun of throwing paint on a character to bring them back to full colour. The soundtrack is also lots of fun. The battles are fought with cards - similar to those in the previous Paper Mario games. Each card you play results in Mario performing a particular 'attack'. The battles are entertaining and lively and we found some of the attack moves really funny. Of course, this would not be a Mario game without hidden areas. The world, like Mario, is made of paper so can be folded, cut and rolled to help find secret places and open new parts of the huge world. Our boys really love this game. It's lots of fun, lively and, as with all great games, has a good introduction and tutorial to get you started. I don't think it is too early to say it... this is one to put on the Christmas list! 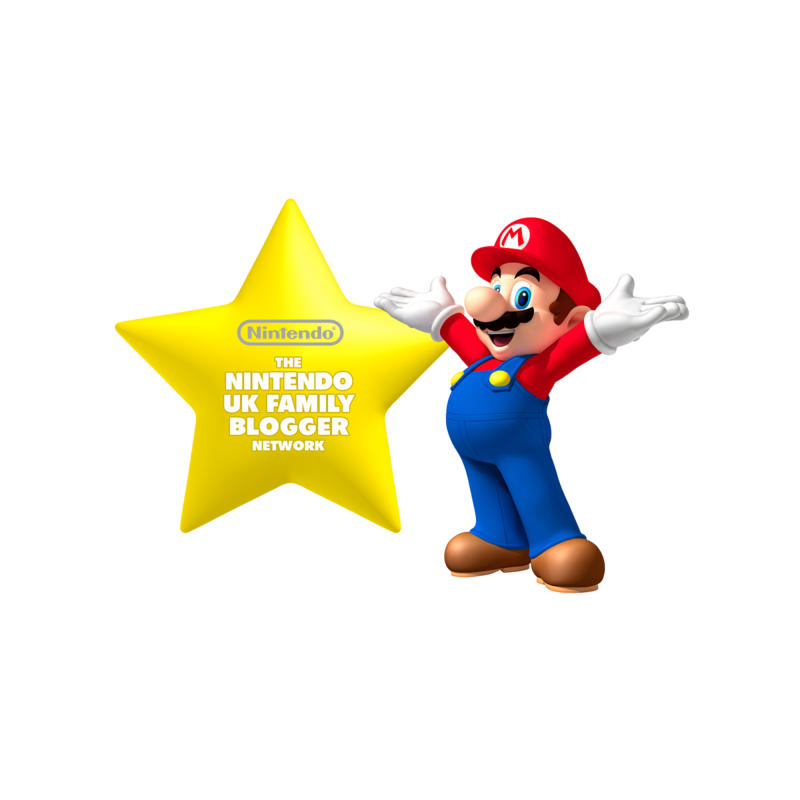 Find out more on the Nintendo website. As Nintendo Family Bloggers we were sent a download copy of Paper Mario: Colour Splash for the purposes of review. All opinions are our own. The conversation went something like this. AEG: Would you like to review a tumble dryer in conjunction with Mumsnet Bloggers? Me: No thanks, I don't like tumble dryers. They are not environmentally friendly and cost too much to run. AEG: The Lavatherm T88595IS uses less electricity hour for hour than a television. Me: Whaaaat?!!! Oh in that case - YES PLEASE! Several years ago, we did for a short while, own a tumble dryer. It was a faff to use and had one of those long hoses that you had to put outdoors whilst in use. I ended up rarely using it and preferred to use the rotary airer outside in the summer and several clothes horses lined up in my bedroom in autumn and winter. Like many people, we believed that tumble dryers were inefficient, expensive to run and not great for the environment. Not so with this one! Being A++ rated it is efficient, low in running costs and a darn sight better for the environment that me having to whack the heating on to dry clothes and keep windows open to let out the damp air. It has literally transformed our wash-life. Before the arrival of this wonderful life-changing product, the AEG dryer, I had to plan when to put the washing on - taking into account the weather, amount of indoor drying space, and whether it was morning or evening (I didn't want damp clothes in the bedroom through the night). Now I can wash clothes whenever I wish to and dry them whenever I wish to. I LOVE the light that comes on to light up the massive drum when the machine is switched on. That feature is much needed for us as we have housed the tumble-dryer in a large built-in storage cupboard. We had the area checked by an AEG approved appliance engineer who confirmed that it would be safe as long as the cupboard door was left open when dryer was in use. But it is dark in there so the light in the dryer has been immensely helpful when loading and unloading the dryer. The lack of light in the cupboard helps explain the photo quality too I'm afraid. The dryer itself actually looks great and if we had space for it elsewhere I would proudly have it in the kitchen visible to all. It is a condensing style dryer so no long awkward hoses. 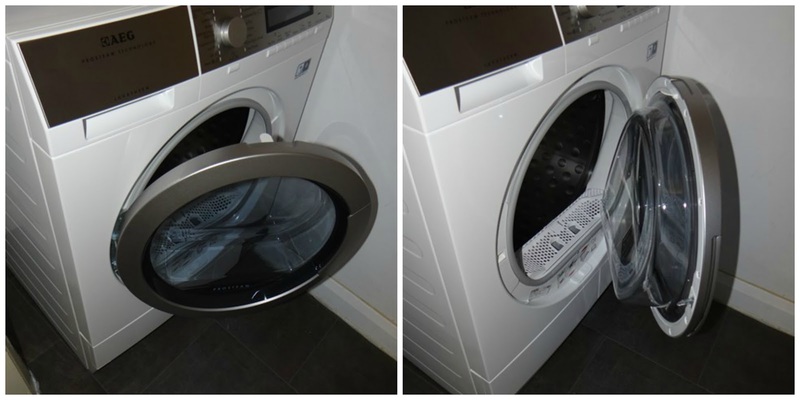 Simply pull out the water container which is housed within the dryer (it looks like the part on a washing machine where the detergent goes) and empties out after use. So simple! The fluff-gatherer (the part that collects the lint from clothes) is also exceptionally easy to use. Simply pull out and empty after each use. 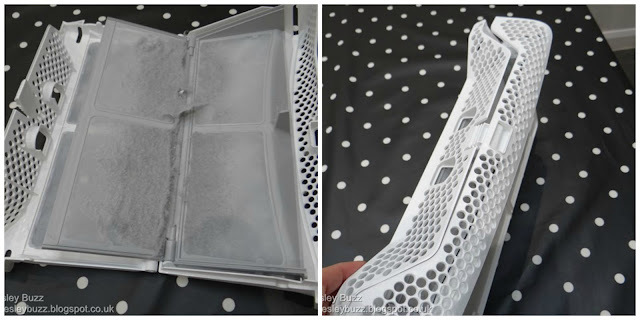 It has been really well designed because it double-houses the lint so it is enclosed within two layers of mesh as you remove the cage from the dryer so no loose bits of fluff falling all over the place as we've experienced with other dryers in the past. It arrived with a bottle of distilled water which can be used to inject steam into the drier for the crease-guard setting, Very impressive. Anything that helps reduce my ironing pile is welcomed with open arms in this household. Having started out as an anti-dryer kind of person, I am a total tumble-dryer convert. I don't think I could live without it now! 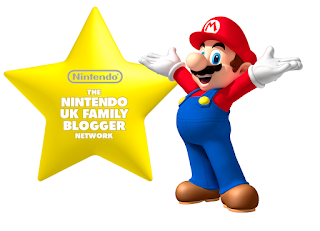 “I am a member of the Mumsnet Bloggers Panel, a group of parent bloggers who have volunteered to review products, services, events and brands for Mumsnet. I have not paid for the product or to attend an event. I have editorial control and retain full editorial integrity"
Sonic Boom: Fire & Ice is the latest fantastic game in the Sonic Boom series for the Nintendo 3DS (and so compatible with the Nintendo 2DS). The story is that Dr Eggman has discovered a powerful element called Ragnium, and he’s using it to create an army of super-fast robots. It's up to Sonic and his friends to save the day. This is a brilliant, fast-paced platform game for up to two players. You start out as Sonic, but unlock other characters as you complete levels. Each character has their own special skills and tools that you need to progress. The aim is simple - defeat the foes scattered through the levels, get to the end and eventually take on the big boss himself. But it is a bit more tricky to actually do it, and you will need all your skills and all the characters to do it. Once you have a character unlocked, you can switch instantly between them in a level. The Fire & Ice part of the game comes from the special ability the characters have. When in Fire mode, they can melt ice (so can get past blocks that are in the way). When in Ice mode, they can freeze water into ice so can walk across without sinking to nasty spikes below. The controls are easy to get used to (even Dad managed this one!) and are similar to other Sonic Boom games (like Sonic Boom: Shattered Crystal that we've also reviewed). There are also useful hints and tips on what to do next and what controls you need to help you as you start out. With each level you have the choice of either dashing through to try to complete it really quickly (this has some benefits if you have StreetPass enabled), or take your time to try to find all the hidden puzzles and secret areas. We love this game and have found it really fun. Definitely one to put on the Christmas list for any gamer. Review by D, aged 10, and daddy (a bit older). More information about Sonic Boom: Fire & Ice is available from the Nintendo UK website. As Nintendo Family Bloggers we were sent a download copy of Sonic Boom: Fire & Ice for the purposes of review. All opinions are our own. Will she have a #brightFuture?